Disney released a lot of new information and exciting details about Star Wars: Galaxy’s Edge today at the Star Wars Celebration convention in Chicago. One of the biggest announcements detail is that Disney and Coca-Cola have come together to create specially designed products for Star Wars: Galaxy’s Edge. These new bottles were designed to blend into the Star Wars universe seamlessly. We think that they did a great job — just look at them! Don’t they look so futuristic and INTENSE? Disney shared that the unique Coca-Cola products were designed with storytelling in mind. 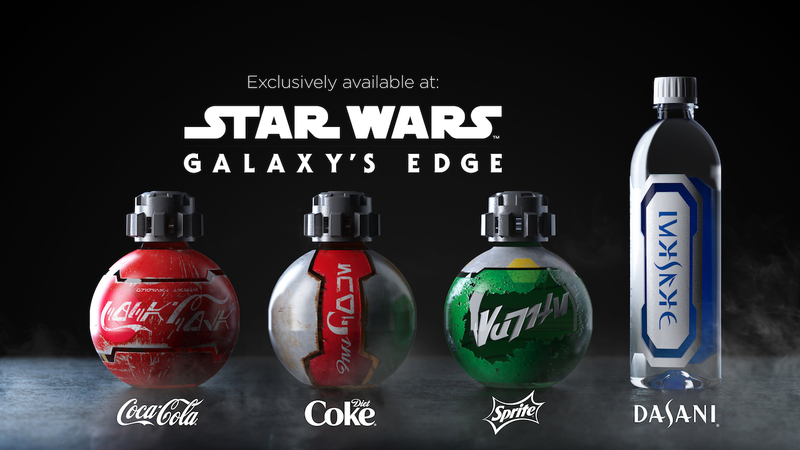 They also shared a video that will give you a glimpse into Star Wars: Galaxy’s Edge, as well as an exciting look at these new Coke products! Disney has had a long history with Coca-Cola, dating all the way back to the opening of Disneyland Park and the “Refreshment Corner” on Main Street U.S.A. in 1955. Isn’t it cool to see them teaming up again to create such a unique and fun product? Want to know more about Star Wars: Galaxy’s Edge? Then check out the pages below! And take a look at our Star Wars: Galaxy’s Edge page to learn more about what will be featured in the land!